My husband found Smart Earth through an online search, and was impressed that when he called, Gabriel was ready to make an appointment promptly. When Gabriel came over, we were even more impressed. He was punctual, respectful, polite, and happy to explain exactly what he was doing and why. He talked about pricing up front, and was cheaper than the person we’d had come out previously to fix 2 broken sprinkler heads by far. The minor adjustments he made, in addition to fixing the broken head, made a huge difference in our yard. We could see the spots that had been dying earlier that now had grass, even with only watering once a week – legal requirement. When we noticed a couple of heads were getting overgrown, and needed cleaning, and that one was leaking, we asked him to come over to kind of “tune up” the whole system. He was happy to make a convenient appointment for us again. Then, when he happened to finish another job early, he called and asked if it’d be convenient to come over two hours earlier, or if we should keep the original time. I love that he called first to check. We have two little dogs who are usually really sweet, but are bad barkers when strangers come to the front door. It’s embarrassing, but Gabriel didn’t care at all, which was nice. I showed him the sprinkler that seemed to be leaking, and asked about the tune up. He helped me rearrange my husband’s motorcycle in the garage so he could get to the sprinkler panel more easily, and when he left at the end of the job, he put it all back without me even thinking about it. That attention to detail really makes it for me. The tune up on the whole system was $95. We also needed replacements on 2 spray heads ($40 for both), a rotor head ($45), and one that needed raising with a replaced nozzle ($15). I paid him with a check. So our system is now perfect for a total of $195. Now, we’re saving a ton of water from being wasted by hitting the fence, our patio furniture, going into the street, or leaking into the ground. It’s going exactly where it needs to go, efficiently. Pretty difficult to do anything to make a difference in this drought, but his fine tuning really made a difference, and will now help the other sections of our yard that needed help- it doesn’t look like a giant patch of straw anymore. I thought it was nice that he remembered enough to notice the difference he’d made. 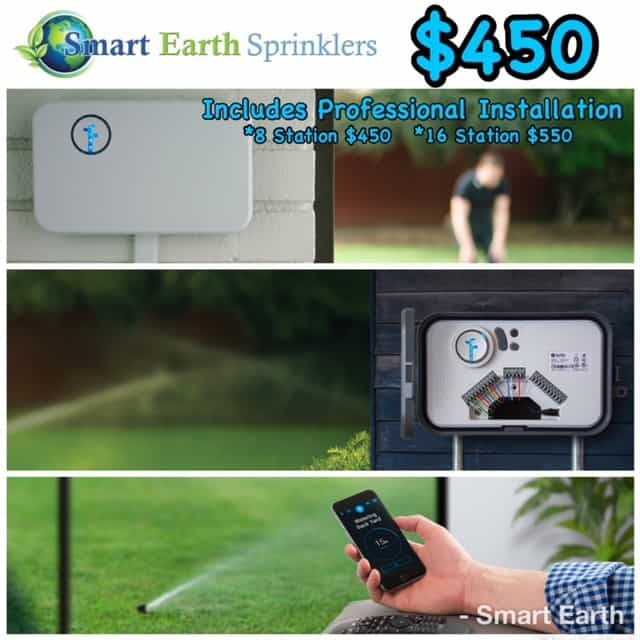 If you need any help with your sprinklers, call Smart Earth- You’ll be amazed at the level of service you get for such a competitive price, and Gabriel is great for scheduling appointments when it works for you. You won’t regret it! Sprinklers are a special kind of difficult for even handy guys like my husband, and Gabriel makes it easy, without hurting your wallet. We will definitely be using him longterm whenever something goes awry, and for an annual tune up. I was referred to Gabriel at Smart Earth Sprinklers for a repair that I couldn’t quite handle myself. He came out the exact time that he committed to and was able to diagnose my sprinkler issue rather quickly. He returned the next day with the materials to repair my broken piping and he fixed it himself. He has a professional demeanor and I will definitely contact him again and refer him to any of my friends or family in the Austin area for their sprinkler repair needs. We were having trouble with our sprinkler system. I wanted to get the system running correctly with the start of another hot summer. Gabe came out and checked the entire sprinkler system. He took his time and watched each station run. He was quickly able to see our problem areas. He was able to repair and or replace the broken sprinkler heads. He even went and purchased a particular part he didn’t have on his truck and came right back and installed it. The entire system works great now. I was so pleased with his prompt service, that I called him to do the same routine maintenance with my Mother’s sprinkler system. He unclogged and repaired several of the sprinkler heads on her system and re-programed the control box. She was very happy with Gabe’s service. I will definitely recommend Smart Earth Sprinklers to my friends and co-workers! I just had a sprinkler system installed by Smart Earth Sprinkler and they did a great job. We had quotes from several places and his was neither the cheapest, nor the most expensive – just right in the middle and very reasonable. Gabriel worked around our landscaped beds and raised beds, adding drip and micro irrigation where appropriate. I didn’t know much about sprinkler systems when we started the process, but I love that he was able to customize everything perfectly for our yard and garden. I would highly recommend Smart Earth Sprinklers. They got the work done quickly and efficiently and at a great price. No up-selling, no cheesy sales tactics, just honest work. The whole experience was great. I called and immediately scheduled an appointment. I received a call from Gabriel 10 minutes before my appointment letting me know he was 10 minutes away. 10 minutes later, my doorbell rang. Gabriel was professional & courteous. I typically try to fix everything myself, but this time I was out of my skill set. With that said, Gabriel let me shadow him and even explained exactly what he was doing every step of the way. He was able to locate two leaking valves in two different spots quickly and began digging up the buried boxes. Shortly thereafter he confirmed I was okay with the price to replace each valve and even recommended I wait until the other 2 valves break until I fix them, especially now that we know where they are. Leaving money on the table? I think not…I’ll definitely use him to replace those when they do go out and now I’m writing him a review of how great his service was. Within 2 hours, my sprinkler system was repaired. The previously buried boxes are now easily visible with all the dirt put back around them, making everything look clean and brand new.